We specialize in the development of Graphical User Interfaces for FEA/CFD programs for Windows and have more than 20 years of experience in this field. 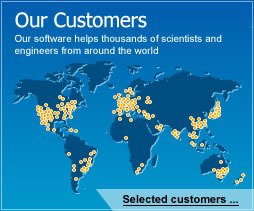 We are pleased and honored that our software is used by thousands of customers from around the world, including World's Top Universities that use our programs for research or education purposes. HYDRUS 2D/3D - software package for simulating water, heat, and solute transport in variably saturated porous media. Hydrus-1D - one-dimensional free version of HYDRUS, developed in cooperation with University of California, Riverside, USA. DREAM Suite - software package for inverse modeling (parameter estimation, data assimilation, model averaging, etc.) using Bayesian inference methods. The rapid development of applications based on Markov Chain Monte Carlo (MCMC) and Differential Evolution Adaptive Metropolis methods. Extended support of the standard version of HYDRUS and/or modifications of the graphical user interface or computational modules based on clients' specification. Rapid development of FEM applications based on the MESHGEN Plus software package.